Design your own custom pillows for your home. Our pillows can be designed for indoor or outdoor use. If your cushion, pillow or drape will be exposed to direct sunlight, we recommend choosing a Sunbrella™ 100% solution-dyed acrylic fabric. Welcome to Cushion Source, your one stop for all your cushion needs. Founded in 2004, Cushion Source has been providing indoor cushions and outdoor cushions for more than a decade. We strive to provide quality custom cushions for standard-sized and unique-shaped furniture. If you don't see exactly what you're looking for, don't hesitate to give us a call at 888-348-2371, because there isn't a cushion shape, style or size that we can't make for you. Our attention to detail is second to none. Cushion Source will provide you with a beautiful Made in Canada custom cushion that you will be proud to display inside or outside your home or business. Full customization, hundreds of fabric choices and generous trim choices are available for bench cushions, chair cushions, outdoor cushions, chaise cushions and more. Made in Toronto to your specifications, all of our custom cushions and pillows are made with solution-dyed acrylic fabrics from Sunbrella that carry a 5-year warranty, offering the highest quality and durability available against colour fading or loss of strength. Cushion Source also makes custom indoor furniture cushions with our wide selection of fabric blends, or we will be glad to use your own chosen fabric. 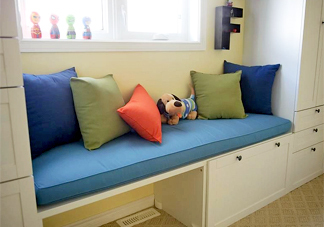 No seat cushion job is too small or too large; there are no minimum order requirements on indoor cushions or patio cushions made in Canada. Custom Canadian made replacement cushions are our specialty at Cushion Source. Unlike the big box retailers, we manufacture quality cushions that are long lasting and backed with our superior quality guarantee. You can place your order directly with our customer service department at 888-348-2371. After hours? No problem, simply contact us and we will be in touch. Thank you for visiting Cushion Source Canada! We look forward to exceeding your expectations with quality custom cushions and pillows that last! Sign up to receive exclusive emails regarding special offers and promotions.